St Lucia is one of the top honeymoon destinations in the world and after a beautiful week of utter paradise on this gorgeous island, I can certainly see why! We stayed at the luxurious Calabash Cove Resort and Spa in the North of St Lucia island, and opted for the all-inclusive package due to the high praise their restaurant, Windsong, has received. We were blown-away by the beauty of the resort and the quality of the accommodation, food and friendly service! We picked Calabash due to the high praise it has received as one of the best St Lucian all inclusive honeymoon destinations, due to the level of luxury, service and the fact that it is adults only too! After an eight hour direct flight to Hewanorra International Airport (UVF), the bigger of the two airports in St Lucia, our hotel pick up was waiting to whisk us away to the north of the island towards Calabash Cove Resort. One of my fears with hotel pick-ups is that there is no one waiting for us when we land after a long and tiring flight - however there was no such issues on this occasions and our driver even treated us to a cold St Lucian Piton beer during the drive! Be warned that the drive to the north of the island from Hewanorra International Airport is over an hour long and involves winding mountains road which could induce travel sickness in some people! Also the road to the resort itself hasn’t been maintained, but this isn’t a problem if you plan to stay in the resort for the majority of time, or travel by taxi. When our taxi pulled up to Calabash Cove Resort we were greeted by one of the most spectacular views I’ve ever seen! The open air reception area looks out the beautiful Windsong restaurant and onto the ocean, with the sun rising and setting directly in front of it. At full capacity Calabash Cove only holds 22 guests, which means it never feels crowded. It is also an adult only resort, which means there is a relaxed and serene feel to the whole resort. There is a variety of accommodation options, the most luxurious and private of which being the cottages, which all have views of the beachfront and direct access to it too. These are perfect for honeymooners, especially combined with the hotels St Lucia honeymoon package! In fact, Calabash Cove is one of the hotel in St Lucia that also host weddings! There is also accommodation in the main building with direct access to the infinity pool and in much closer proximity to the amenities such as the bar and restaurant. Every single room has its own balcony or patio so there is always an outdoor space to enjoy. We stayed in cottage five which had its own private pool, a huge outdoor space with loungers, dining table and a hammock too. The cottage was also surrounded by palm trees, calabash trees and an array of beautiful wildlife including our own resident hummingbird too! Inside the bedroom is air conditioned with a jacuzzi as well as outdoor shower. There is also a large living space with a full stocked bar, mini fridge and a huge flat screen TV, which came in handy on the stormy nights which can hit during the winter season! A short walk up from the cottage leads to the resorts infinity pool, with a direct and breathtaking view out onto the sea. There are also rooms which lead out straight onto the infinity pool. As well as this there is also a pool bar right beside the pool, meaning you can sip cocktails whilst in the pool watching the sunset. Most packages at Calabash Cove are all inclusive, and this is definitely the option to go for. Food is served in the main restaurant, by the pool bar and can also be delivered to your room or cottage. The Windsong restaurant is a breath-taking space which serves breakfast, lunch and dinner, and also happens to be one of the finest restaurant in St Lucia. The chef strives to incorporate a taste of St Lucia on his menu and uses only local fresh ingredients in every dish. There are daily specials on the menu which are different every day. The menu also changes regularly so that in the week we stayed there we didn’t need to order the same dish twice. Our favourite breakfast dishes were the Eggs Benedict served with bacon, sausages and salad, French Toast and also the Fruit Platter, which was full of local fresh fruit! For lunch I tended to order lighter dishes, such as paninis, salads or fish, such as tuna steak or the ahi tuna. Even these smaller dishes were well prepared and tasted exquisite. Dinner was always my favourite time of day, as the Windsong restaurant would be candle lit, with live music and of course the setting sun. The vibe in the restaurant changes for the dinner service and as a result you don’t feel like you are eating in the same space over again. We normally started our meal with a drink at the restaurant bar and moved onto to the tables to enjoy a relaxed three course meal. We would usually start the meal with a drink at the bar and then settle down to a lovely meal with a bottle of Prosecco or wine. Dinner dishes are generally more lavish than those served at breakfast or lunch. Fish was always a good option to order as it was fresh and well cooked. We loved to start with either a vegetable or pork tempura which were delicious and our favourite main course was normally a meaty dish such as the pork rolls or chicken milanese. The portions sizes are sizeable and so it was often difficult to fit in a dessert! However we normally caved and ordered the dessert special of the day, which rounded of our meal perfectly. During the entire time of our stay we weren’t served a dish that we didn‘t like and on the most part many of their were delicious and beautifully presented! Although Calabash Cove is the ideal place to relax and unwind, they also have a host of activities to enjoy too! As well as a fully equipped gym and fitness centre that is open 24-7, there are also plenty of outdoor water activities, including kayaking and paddle boarding that you can take out any time. Activities such as jet-skiing or diving can also be organised by reception. Calabash Cove is a Caribbean Spa Resort and the Ti Spa is located directly next to the infinity pool and includes an onsite beauty parlour too. The experiences included are designed to relax and rejuvenate the mind and body. Services include facials, body wraps, body scrubs and speciality packages too. 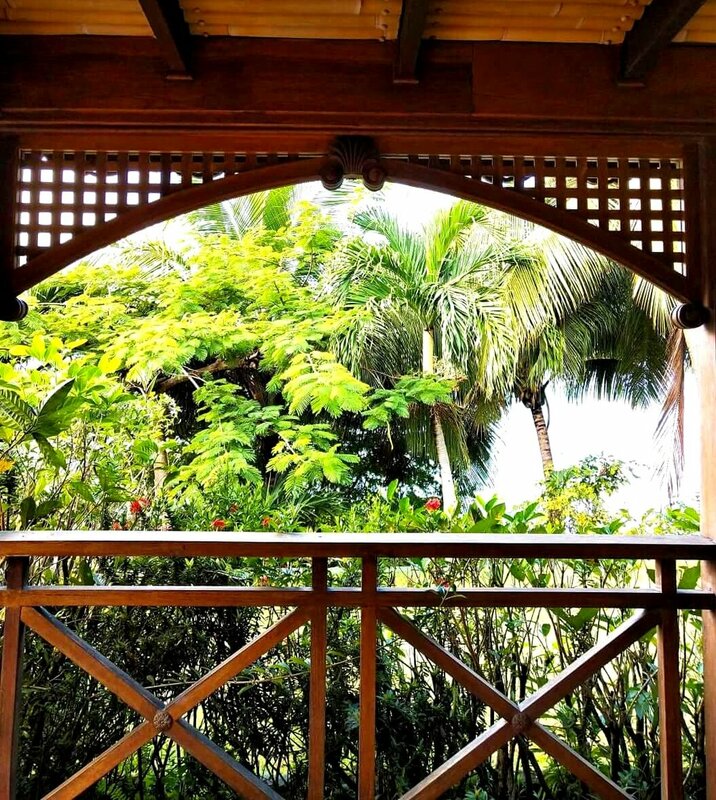 Treatments can be had anywhere on the resort, including, your room or the sea facing gazebo. Calabash Cove Resort and Spa is a luxury boutique hotel which will take your breath away. The hotel compliments and emphasises the natural beauty of its surroundings. All the rooms have a level of luxury so regardless of the room you choose you are guaranteed to enjoy your stay. The all-inclusive package is well worth the price, as the chef is phenomenal and serves food cooked to the highest calibre time after time. In addition the staff and service was exceptional, with service being professional yet friendly and attentive and we were very impressed with the high level of customer care that was maintained throughout our stay. I would recommend Calabash Cove and to anyone who wants to spend a fully relaxed, luxurious and fun stay in St Lucia, especially as it is an adults only resort! In my opinion, this is one of the best all inclusive hotels in St Lucia! Book your stay at Calabash Cove Resort and Spa! Have you been to St Lucia? Let me know where you stayed and what you got up to in the comments below! Special thanks to Konrad, Kevin and all the staff at Calabash Cove for their hospitality!